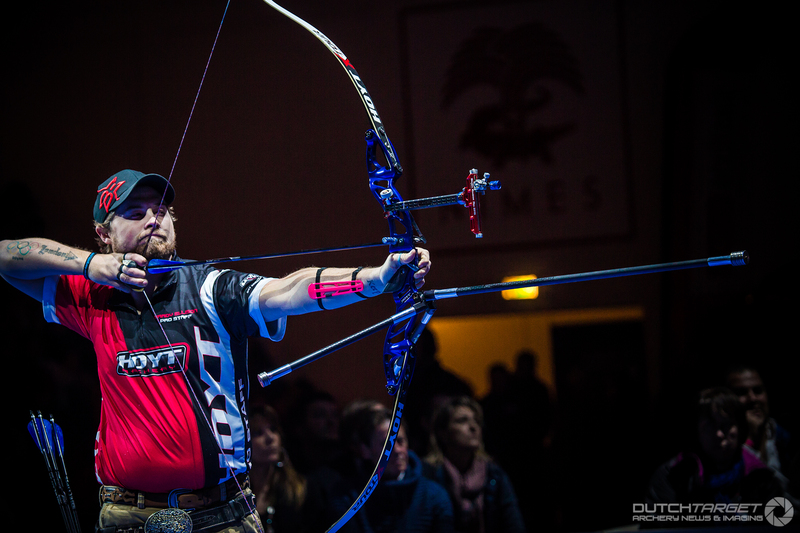 After a spectacular 2016, Brady Ellison opened 2017 with an incredible statement: breaking his own indoor world record in Nimes. In the ranking round he shot 599 out of 600 with a perfect second half, the very last arrow just half a shaft inside the line – to pandemonium in the hall. He continued his form in the individual rounds, but was just beaten – by millimeters – in a semifinal shoot-off by the 2012 Olympic champion Oh Jin Hyek, on a campaign to be back on the Korean front line for 2017. 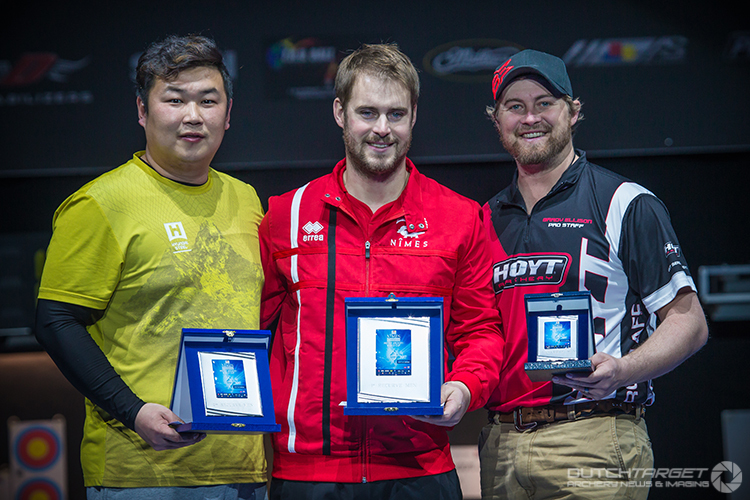 Brady went on to take the bronze medal against Tom Hall of Great Britain with sets of 29,30,30,30 – just one of a series of very high quality finals at the French stop on the indoor tour. 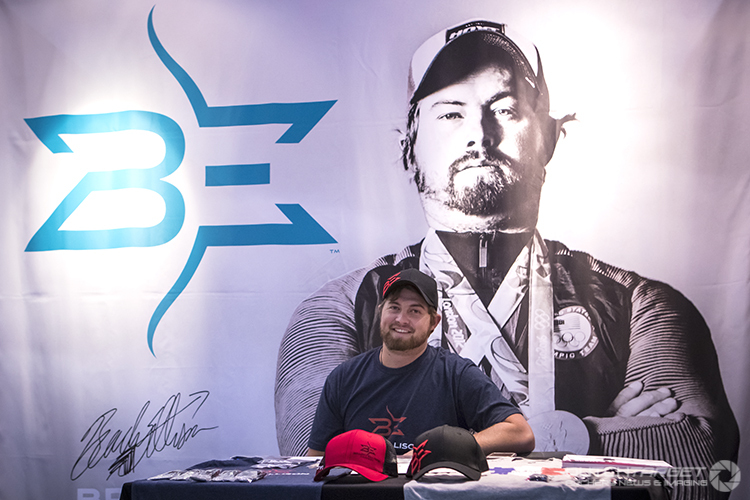 Brady has another big project both on and off the archery field this year, a branded clothing range bearing his name and a distinctive logo. It’s very much a joint project between him and his wife Toja Ellison, also in Nimes for the first indoor World Cup event of the year. We caught up with him shortly after his record-breaking ranking round. What’s going to be in the range of clothes? We’re hoping to have a different custom shirt for each tournament, all of which you can custom order off the website.There’s going to be women’s shirts, leggings, visors, different things. There’ll be like five to seven core items that dealers can order that won’t change, but otherwise there’s going to be new shirts and new designs up all the time. If something’s not selling, we’ll change it. We can ship anywhere in the world. The website, bradyellison.com, should be up around next week. The logo looks great.  The Hoyt design team designed the logo for me, and kinda surprised me with this idea. We’re partnering with them on some of the shirts and hats. 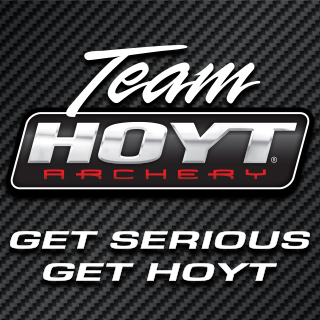 I’m very thankful that Mike and the Hoyt team have kind of let me take over my first kind of small business. I’m going to be doing a lot of the marketing, but I can report back to them if I need help. Toja and I are just going to run with this and see what happens. Why now? I’ve wanted a signature line of something for ever, and I’ve always wanted a signature bow or something. 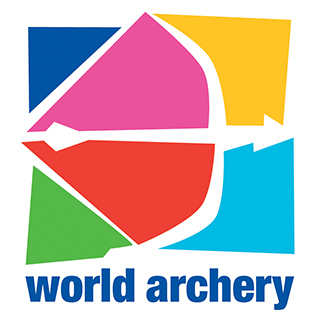 But something like this, clothing, I think is better than a bow in the industry because this can reach people across the world, outside of archery. You have a signature riser, people aren’t going to buy it if they’re not an archer. People that don’t shoot will still buy clothes and that sort of thing. We’ve seen a few archery start to develop their own ‘personal brands’ in the sport recently. I really think that high-level tournament archers sell product. Companies are starting to realise that when you put someone who wins a lot of things, when you put their name on your products they sell more. It’s a way for shooters to get a little more guaranteed-type of income, make themselves a little more financially stable. You’re also out there and involved and talking to people a lot more than you might get with just normal sponsorship. This won’t be a distraction at all? No, it really won’t. This is the first tournament where I’ve been selling things, but it doesn’t really feel any different. Now, instead of me being around and about and people stopping me to take pictures and so on, I’m sitting in a booth and people are coming up to me. I’m taking a little money for product, but I’m the same and the tournament atmosphere is the same. And I don’t think the world record here is going to hurt with the branding, no! What are your plans for this year? Win everything, I guess. [laughs] This year has already started awesome. I hope this bow (Faktor) shoots as well outside as it does indoor. I haven’t even put an X10 on it yet. I want the world championships, really bad. Getting the fifth world cup final would be cool. This year I think we’re going to Rome; I’ve always wanted to go to Rome. I’ve always wanted to see the Colosseum. We might be shooting next to it. We’ve got a World Cup in the US too, so that’s nice. We’ll just take it one tournament at a time and see how it’s gonna go. Who do you think will be your strongest competitor this year? Every year, someone emerges that you don’t expect. Just after an Olympic Games, some people will fall off, and you’ll get a bunch of new shooters coming up. Ku Bonchan and all the Korean team are going to be tough. You’ve got Italian guys shooting good, French guys shooting good. I see JC (Valladont) shooting real good this year. This might be a year we see scores going up again from the top eight guys.